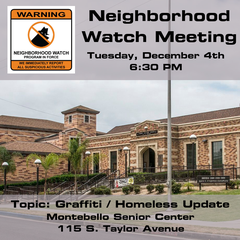 Join the Montebello Police Department and other community members for a Neighborhood Watch Meeting. The event is hosted at the Montebello Senior Citizen Center, 115 S. Taylor Avenue at 6:30 pm. We will be discussing graffiti and providing an update on our progress with helping the local homeless population. As always, if you have any questions about how to get involved with Neighborhood Watch we will happy to give you the answers you need. Any questions, please contact Corporal Scott Howard from the Community Relations Unit at showard@cityofmontebello.com or (323) 887-1342.